Is depth at center for Boston becoming an issue? Some would say in the hockey world that defense and goaltending win Stanley Cups. While that is all true, depth amongst the third and fourth lines also play an intricate role in making a trip to Lord Stanley. For instance look at last years Los Angeles Kings squad. The third line for the Kings last year featured Tanner Pearson, Jeff Carter, and Tyler Toffoli. A line which created all sorts of energy, and an assist from Toffoli on the GWG in their Stanley Cup win in game five against the New York Rangers. What did their fourth line produce? A line of Kyle Clifford, Mike Richards, and Trevor Lewis who chipped in their part during the Stanley Cup by tallying five points in the five games in large part due to Clifford, and Richards. A point a game coming from your fourth line is not to shabby at all. As Bruins fans we can also go back to the depth of the Chicago Blackhawks who stole the Stanley Cup right beneath Boston's skates in 2013. Guys like Dave Bolland, Andrew Shaw, Brandon Saad, Brandon Bollig, Marcus Kruger, and Michael Frolik might ring some bells for those Boston fans that had to endure the heartbreak of 2013. Those six players represented the bottom six forwards for Chicago that season, and were a major reason Chicago won the Stanley Cup because of the depth they brought, and veteran leadership some of them were able to provide. Those bottom six forwards for Chicago produced fifteen points in six games during their Stanley Cup victory. This is why depth is so vital come playoff time because those bottom six forwards usually provide veteran leadership, and ability to create offense while being able to be strong two way forwards. For those now thinking Boston forward Ryan Spooner is playing Carl Soderberg out of a job in Boston; it is those reasons above as to why Carl Soderberg will not be chased out of Boston by Ryan Spooner. Carl Soderberg is a major and I mean major reason as to why that third line succeeds with Loui Erikkson, and whomever they choose to play right wing (Reilly Smith or Brett Connolly). Carl Soderberg is a two way forward who can create offensive like a top six forward, but also is huge asset in that he is not a liability when Boston is in their own zone. Ryan Spooner on the other hand has deserved to be on the second line with Milan Lucic, David Pastrnak, and as we saw verse Detroit Brett Connolly. Ryan Spooner has been able to energize Lucic back to him old-self, and is providing strong playmaking abilities registering ten assists in twenty-six games. However, Spooner and Soderberg are completely different players. Spooner creates trouble for defensemen by using his speed, finesse, and vision to generate offense for guys like Lucic, and Pastrnak. Soderberg on the other hand is a tough customer who will fight for loose pucks in the corner, be reliable in the defensive end by giving support to his defensemen during the breakout, and using veteran poise he has shown with the puck while in the offensive zone. Finding players like Carl Soderberg is tough to come by in this day and age of speed, and finesse where teams are now valuing offensive fire power over two way forwards. The plus/minus rating for these two players also tells the tale of the tape. Spooner has produced a plus/minus of just two in his twenty-six games, while Soderberg has produced a plus/minus of twenty-six in 79 games. Sure you can argue, well Spooner has played less games so he hasn't had a chance to produce higher numbers in the plus/minus category. What that stat does show is defensive responsibility and who is better at it. As Boston's defensemen are getting banged up by the second that makes it even more crucial for forwards to play stronger defense. That is why having a veteran bottom six forward is critical for Boston, and why Carl Soderberg will not be going anywhere. 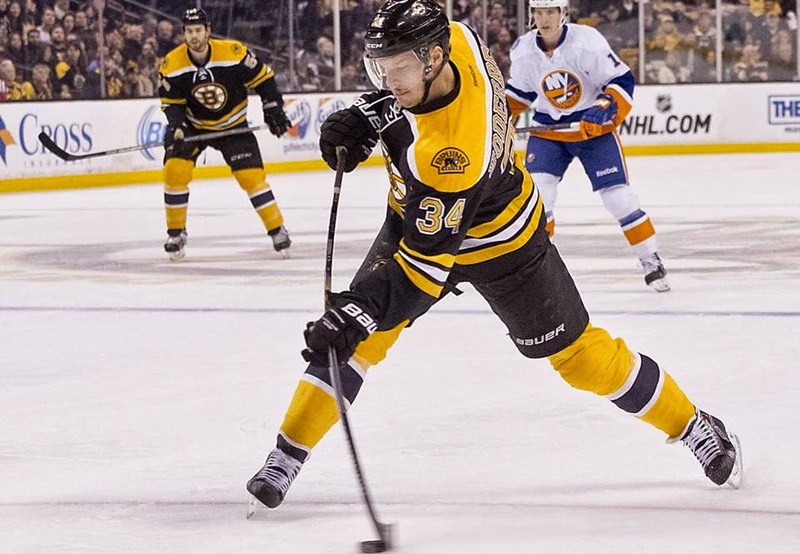 Let's also not forgot that Carl Soderberg is third in points for the Bruins with 44 (13 g, 31 a). Come playoff time (if that in fact happens) I would not be surprised at all if Boston decides to use Soderberg in crunch time situations where Boston may need a critical face-off win, or veteran leadership on the ice to secure a playoff win.